In early September, a team of transportation experts, researchers, and engineers successfully demonstrated a five vehicle platoon test on an inactive naval air base in Willow Grove, PA. The team included personnel from the Federal Highway Administration’s (FHWA) Saxton Transportation Operations Laboratory, Leidos, TORC Robotics, and California Partners for Advanced Transportation Technology. 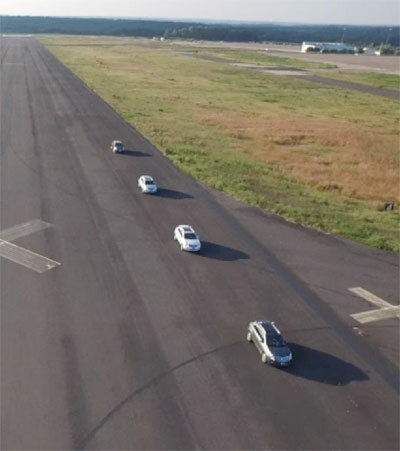 To demonstrate platooning and expand on current connected vehicle research, the team spent 2 weeks at the base testing a fleet of Cadillacs equipped with Cooperative Adaptive Cruise Control (CACC). 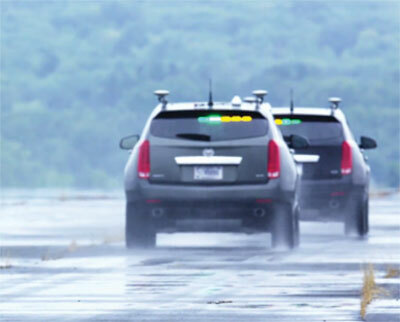 The Cadillac fleet running test maneuvers on the runway in Willow Grove, PA.
An extension of adaptive cruise control, CACC enables vehicles to communicate and respond to one another in a proactive manner. CACC eliminates lag time between vehicle communications (such as reaction time by human drivers or time required by radar-sensing vehicles) which may prevent collisions that are caused by delays in reaction times after sudden braking or stopping. Using dedicated short-range communication (DSRC), vehicles are able to maintain constant speed and distance with the vehicle in front of them and surrounding vehicles. They have the ability to communicate their speed and at what point they decelerate, allowing other CACC capable vehicles to follow suit and avoid staggered stopping or delayed braking. The green and yellow lights on the test vehicles indicate communication and connectivity between the cars. After 2 weeks of testing and coding various algorithms, the team successfully demonstrated different CACC platooning maneuvers with the vehicle fleet using DSRC for communication between the cars. One of the maneuvers included a demonstration of the third vehicle pulling out of line and rejoining in the rear while the fourth and fifth vehicle closed the gap caused by the absent third vehicle. The cars accelerated and decelerated based on fixed headway settings, maintaining a precise distance – even coming to a complete stop in unison. This groundbreaking research could be a future solution to congestion and roadway safety as it can prevent unnecessary accelerating and decelerating and establishes safe and constant speeds with other vehicles. The above figure shows a rear view of the Cadillac fleet as they platoon on the runway. FHWA Associate Administrator Michael Trentacoste who directs the Turner-Fairbank Highway Research Center (TFHRC) and Joseph Peters who directs FHWA’s Office of Operations Research and Development visited the test site and observed the research. After taking a tour of the base, they watched the vehicles from a distance and then rode in them during the demonstrations. They were also interviewed on the project site for a short video that is being produced on this groundbreaking research. The video, which is expected to be available in a few weeks, will feature the CACC tests conducted in Willow Grove. The Saxton Transportation Operations Laboratory has been working on this research for the past year and will continue to develop CACC methods and conduct additional connected vehicle research. The lab plans to use its test vehicles for more demonstrations and to collect additional data on CACC as to determine its feasibility for future commercial deployment. Traffic incidents contribute significantly to service level deterioration of both freeways and arterials. Traffic Incident Management (TIM) programs have been introduced worldwide with the aim of mitigating the impact of traffic incidents on safety and roadway performance. These programs support quick incident response, thereby shortening incident duration. They also aim to control traffic demand around the incident scene. As some TIM programs can be costly to taxpayers, it is important to evaluate their benefits and determine the associated return on investment. The figure above shows a screenshot of the TIM-BC navigation page with panels linking to all eight sub-tools. The research team at TFHRC, led by FHWA’s Taylor Lochrane and Leidos’ Jiaqi Ma, has developed a TIM-Benefit-Cost (B/C) tool with standardized methodology, which can be universally and equitably employed to estimate B/C ratios for different TIM strategies. The tool advances consistency and therefore a greater confidence in the validity of results. With access to the methodology in the form of an easy to use, less data intensive tool, TIM programs and taxpayers alike can benefit from cost-effective evaluations. The tool consists of eight different subtools that can evaluate different TIM strategies, shown in the screenshot below. The eight tools include safety service patrol (SSP), driver removal laws, authority removal laws, shared quick clearance goals, pre-established towing service agreements, dispatch collocation, TIM Task Forces, and Second Strategic Highway Research Program training. A key user interface of one subtool, SSP-B/C, for evaluating safety service patrol, is shown below. In addition to basic SSP program information (such as location, number of vehicles, and required staff), the user can input information on roadway geometry, the SSP program, traffic, weather, and incidents. The tool can also automatically generate an evaluation report that is professionally designed for an effective presentation of evaluation results. 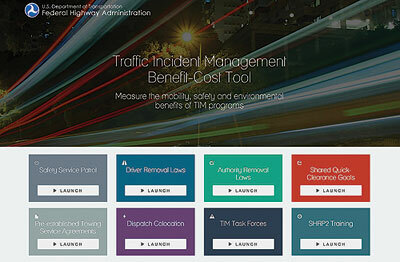 This Web-based tool offers helpful benefit and cost evaluation for transportation agencies. It can help agencies avoid inefficient and costly TIM strategies and could be useful in mitigating lengthy delays and traffic incidents on the roadway. For more information, contact Taylor Lochrane at taylor.lochrane@dot.gov or Paul Jodoin at paul.jodoin@dot.gov. In October, construction will begin to upgrade the Cooperative Vehicle Highway Testbed (CVHT) located at TFHRC. This project was established through an IAA between TFHRC and the Eastern Federal Lands Highway Division (EFLHD) of FHWA. It was selected as an FHWA strategic initiative and involves modifying the existing CVHT infrastructure at TFHRC. Specifically, it will entail creating a fully integrated, connected vehicle-to-vehicle and vehicle-to-infrastructure testbed to support researching involving communications between vehicles, pedestrians, and roadway features. The intersection will be equipped with standard pedestrian signal heads and accessible push buttons, as well as Americans with Disabilities Act-compliant curb ramps and landings. Also included will be state-of-the-art technologies, such as wireless solutions (i.e., DSRC and Wireless Fidelity). Research from the Office of Infrastructure involving pavement sensors, a test section of concrete sidewalk, and a test section of concrete pavers is also integrated into this project. The work includes creating new asphalt roadways, the realignment of existing roadways, asphalt pavement widening, improving an existing signalized intersection, installing underground conduit and pull boxes, marking the pavement, constructing pedestrian sidewalks, and other tasks. In the spring of 2016, the Office of Safety is planning to test pedestrian safety applications using V2I technologies. EFLHD will complete the design and administer the construction of this project. FHWA’s Joe Bared, together with Christopher Melson and Cory Krause, published a research paper in the June edition of the Institute of Transportation Engineers Journal regarding an alternative freeway interchange that reduces congestion and emphasizes land savings. The article features recent research conducted to reduce land use and improve mobility, performance, and safety on freeway interchanges. While the physical ability and funding available to make changes on already existing freeways is quite challenging, Melson, Krause, and Bared have shown that nontraditional design concepts can provide efficient means of transportation without sacrificing performance. The published study presents an all-directional system interchange, called the one-sided interchange that intends to do just that. The one-sided interchange is unique in that it utilizes the lack of right-of-way to enhance uninterrupted traffic flow. The interchange is intended to be space efficient with speed-constrained loops, allowing for more movement within a smaller location. As shown in the figure below, the interchange is designed with full access control for all turning movements. Compared to the full clover-leaf interchange design, the one-sided interchange design requires a smaller footprint. 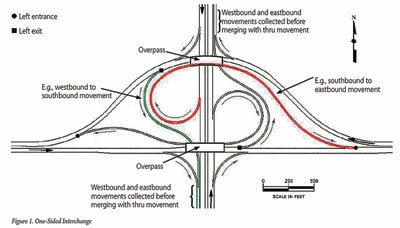 The figure above shows an example illustration of a one-sided interchange. Using microsimulation software and CADD, the interchange was analyzed for efficiency, throughput, and safety. While results of the microsimulation outputs showed similar performance to an equivalent clover-leaf interchange in terms of delay and throughput, further research needs to be done on the feasibility and financial requirements of the one-sided interchange. Additional studies are currently underway and will be presented in future publications. FHWA’s Mohammed Yousuf submitted a video for consideration to be featured at next year’s South by Southwest conference, which will take place in March 2016. The event will feature innovative tech ideas in the music, film, and interactive technology industries and encourage the development of new and creative research concepts through technology. The video submitted by Mohammed features the importance of accessible transportation in society and how connected vehicles are improving mobility for travelers who may be disabled or require assistance getting from one place to another. If the video is chosen by the panel, it will give the U.S. Department of Transportation (USDOT) a chance to talk about the importance of accessible transportation technologies and its future applications The conference would provide a great opportunity to highlight the Accessible Transportation Technologies Research Initiative and educate a vast audience on ongoing and future technologies currently being developed to improve accessible transportation concepts. The judgement panel is scheduled to make selections in October 2015. For more information, contact Mohammed Yousuf at Mohammed.Yousuf@dot.gov. Approximately 18 students, all children of FHWA employees, spent a day at the TFHRC this summer learning about transportation and the benefits of connected vehicles. The minicamp, which consisted of two 3-hour sessions, allowed the students to learn about the technologies and research projects taking place at the facility in an interactive, hands-on manner. In addition to tours of various labs and garages, the students watched live demos with balloon cars and learned about vehicle automation. They also observed simulations of traffic signals and learned how the test vehicles are able to communicate with the intersection. After a 43-year career working for academia, the private sector, and Federal Government, Dr. Joseph I. Peters, Director of FHWA’s Office of Operations Research and Development, retired from Federal service in October 2015. Joe’s entire career was devoted to the fields of systems research, development, test, and evaluation, and ended where it began, at what is now the Turner-Fairbank Highway Research Center (TFHRC). 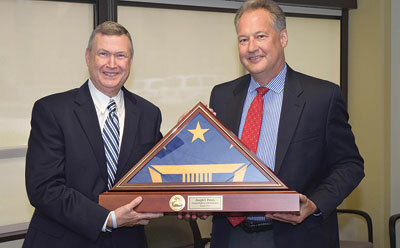 Dr. Joseph I. Peters (left) receiving his retirement commemoration award from FHWA Executive Director Jeff Paniati. As a graduate student at the Catholic University of America (CUA), Joe assisted professors with research supporting the Office of Naval Research (currently FHWA’s Office of Research and Advanced Technology). Joe’s interests in traffic operations and driver behavior led to his achieving an M.A. in Human Factors Psychology (1974) and a Ph.D. in Applied Experimental Psychology (1977), both from CUA. From there, he became a researcher with the U.S. Army and then a research and development manager with the U.S. Air Force. He left the Air Force for an 11-year career with a government consulting company. He then returned to FHWA and worked for 12 years in the Intelligent Transportation Systems Joint Program Office. In 2007, he was honored to be accepted into the Senior Executive Service as Director of the Office of Operations Research and Development at TFHRC. In this capacity, Joe’s most notable work has been in the establishment of TFHRC’s Saxton Transportation Operations Laboratory and its efforts to develop connected automation technologies and applications for vastly increasing the efficiency of the Nation’s transportation system. The work is aimed at reducing congestion, crashes and fuel use while helping to sustain the environment. We congratulate Joe for his immense accomplishments in the transportation industry and wish him the best in his future endeavors. Research team members from FHWA’s Office of Research and Development will participate in the Transportation Research Board’s (TRB) 95th Annual Meeting, which will be held January 10–14, 2016 in Washington, D.C. This year’s theme is “Research Convergence for a Multimodal Future.” The team will present current and future research projects and showcase a vehicle from the research fleet involved in the successful CACC platooning demonstration that took place in Pennsylvania this past September. The team will also play a video of the demonstration highlighting the multivehicle test maneuvers. For more information about the event, visit www.trb.org/AnnualMeeting/AnnualMeeting.aspx.